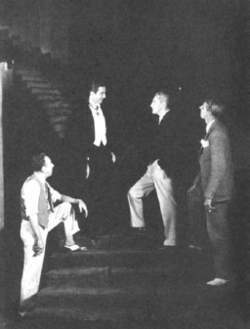 Tod Browning (left, with knee bent) directs the cast of Dracula, including Bela Lugosi (second from the left). 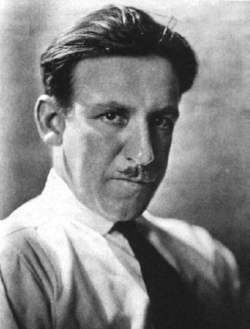 Director Tod Browning, who became famous for directing the classic 1931 version of Dracula. Tod Browning, a career director of horror films who brought both Lon Chaney Jr. and Bela Lugosi to the screen in their first vampire roles, is best remembered today for his work on a single film, Dracula (1931). He was born July 12, 1882, and raised in Louisville, Kentucky, but at the age of sixteen ran away from home and joined a carnival. For years he made his living by assuming various “horror” persona. His carnival performances led to his career as an actor. He appeared in his first film in 1913 and was soon working behind the camera. He assisted in directing for a couple of years and in 1917 directed his first movies, Jim Bludso and Peggy, the Will o’ the Wisp. In 1919 he met Lon Chaney, who had a part in The Wicked Darling. They went their separate ways through the early 1920s, but were reunited at MGM in 1925 and for the next five years had one of the most fruitful collaborations Hollywood has known. Browning appreciated Chaney’s ability to distort his face and apply makeup, and he developed scripts especially for the actor. Together they made The Unholy Three (1925), The Blackbird (1926), The Road to Mandalay (1926), The Unknown (1927), London after Midnight (1927), West of Zanzibar (1928), The Big City (1928), and Where East Is East (1929). In 1927 Browning directed London after Midnight, the first vampire feature film, in which Chaney played both the vampire and the detective who pursued him. The film was memorable because of the extraordinary distorting makeup Chaney developed which, although highly effective, gave him great discomfort. The movie was based upon a novel, The Hypnotist, written by Browning, and then became the basis of a novelization by Marie Coolidge-Rask published in 1928 with stills from the movie. In Browning’s plot, the vampire turned out to be an identity assumed by the detective to trap a criminal. In 1930, as Universal Pictures was making its transition to talking movies, the company hired Browning to film Dracula. Browning immediately thought of Chaney for the starring role and approached him about the part. Unfortunately, before he could respond, Chaney died. Eventually, after a highly publicized search for an actor to play the title role, Bela Lugosi was selected. Browning has been seen by most film critics as a mediocre and unimaginative director, especially criticized for his largely stationary camera. He was now set to do what would become his most memorable film, an adaptation of the Hamilton Deane play as revised by John L. Balderston. Browning is best remembered for adding the opening scenes that occur in Castle Dracula during which Lugosi speaks his most memorable lines. The scene with Dracula standing on the stairs with a giant spider web behind him to welcome R. N. Renfield (in this version it is he, not Jonathan Harker, who goes to Transylvania) has been among the most reproduced images in movie history. These opening scenes lifted the movie from being merely a filmed stage play, the impression it gave once the action shifted to London. Browning’s Dracula must be seen in the context of its time. For all practical purposes it was the first Dracula movie. Few people had seen the banned Nosferatu or the other even lesser-known European attempts at adaptation. It was also one of the first horror movies with sound. Given the level to which movies had progressed, the low expectations for the film’s success, and the financial hardship then being experienced by Universal, the production values of Dracula are understandable. Still, even today the opening scenes are effective, though post-Hammer Films audiences have been quick to note the sanitized presentation of a Dracula without visible fangs who never bites his victims in front of the audience. Nonetheless, one cannot deny the audience response to the movie; Universal credited it with keeping the company from bankruptcy. Browning would go on to make several more films in the 1930s. His next film, Freaks, became one of the most controversial movies of the era. A pet project, the movie harked back to his carnival days and pictured the lives of various people who were born with bodies that pushed them outside of acceptable society. It was banned in twenty-eight countries and was a commercial flop in the United States. He returned to the vampire theme in 1935 with Mark of the Vampire, a talkie remake of London after Midnight. Browning retired in 1939 following his work on The Devil Dolls, and lived quietly until his death on October 6, 1962. Coolidge-Rask, Marie. London after Midnight. New York: Grosset & Dunlap, 1928. 261 pp. Everson, William K. Classics of the Horror Film. New York: Citadel Press, 1990. 247 pp. Glut, Donald G. The Dracula Book. Metuchen, NJ: Scarecrow Press, 1975. 388 pp. Herzogwenrath, Bernd. The Cinema of Tod Browning: Essays of the Macabre and Grotesque. Jeffersonville, NC: McFarland & Company, 2008. 249 pp. ———. The Films of Tod Browning. London: Black Dog Publishing, 2006. 238 pp. Quinlan, David. The Illustrated Guide to Film Directors. Totowa, NJ: Barnes & Noble Books, 1984. 335 pp. Skal, David. Dark Carnival: The Secret World of Tod Browning, Hollywood’s Master of the Macabre. New York: Doubleday and Company, 1995. 359 pp. Thompson, David. A Biographical Dictionary of Film. New York: William Morrow and Company, 1976. 629 pp.